Christianity is the most popular belief in the world with an estimated 2 billion followers. Amish, Baptists, Episcopalians, Greek Orthodox, Methodists, Mormons, Pentecostal, Protestant, Roman Catholics, Russian Orthodox and many more make up the Christian faiths. 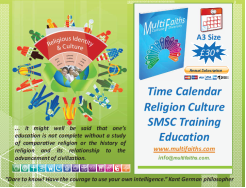 Each faith varies but all Christians believe in one God which has three elements. These are God the Father, Son and Holy Spirit. Christians believe that Jesus Christ is the Son of God. A central concept of the Christian faith is that Jesus was crucified and arose from the dead on the third day. This is known as the Resurrection. The most important text is the Holy Bible which consists of the Old and New Testaments. Christians worship in churches. Spiritual leaders are known as Fathers, Ministers, Pastors or Priests. Each day is made holy through the liturgical celebrations of the people of God, especially through the eucharistic sacrifice and the divine office. The liturgical day runs from midnight to midnight, but the observance of Sunday and solemnities begins with the evening of the preceding day. The church year calendar is built around six seasons and twelve festival days. The first festival day of the church year is Christmas, which falls on December 25. Christians celebrate the day Jesus was born to Joseph and Mary in Bethlehem. On January 1, Christians celebrate the Name of Jesus. On this day the Baby Jesus was circumcised in a Jewish ceremony call a bris, was given his name, and was accepted as a member of the Jewish community, who were the only people in the world at that time who worshiped the One God. The Name of Jesus falls in the season of Christmas. The Baptism of our Lord is celebrated the first Sunday after Epiphany. On this day Christians remember Jesus' baptism by John the Baptist in the River Jordan when he was an adult. A dove came down from the sky to rest on Jesus' head, and a voice spoke from heaven, saying, "This is my son, in whom I am well pleased." The Transfiguration of Our Lord falls on the Sunday before Ash Wednesday. This day commemorates the day Elijah and Moses appeared with Jesus on the mountain top, as Jesus was revealed to his disciples as the true Son of God. A voice also spoke from heaven on this day, which is the last day in the Season of Epiphany. Easter is the day Jesus rose from the dead after he was crucified on Good Friday. The date of Easter is based on the phase of the moon, so the date varies from year to year. Because of this variation, Easter is called a movable feast. The Ascension of Our Lord falls forty days after Easter. It is the day the disciples watched Jesus ascend into heaven, and it marks the end of Jesus' time on earth. The Feast of Pentecost falls fifty days after Easter. Christians celebrate the appearance of the Holy Spirit on tongues of fire on the heads of Jesus' followers, who had met on that day to celebrate the Jewish Feast of Weeks. The Holy Trinity is observed the Sunday after Pentecost. On this day Christians honor the Triune God, God in three persons, Father, Son, and Holy Spirit. Reformation Day, the last Sunday in October,is celebrated by Protestant Christians to honor Martin Luther and the positive changes he made in the daily lives of Christians. It falls during the season of Pentecost. All Saints' Sunday, the first Sunday in November, is the day Christians give thanks for the faithful departed: all the good people God has put in their lives who now live with God in heaven. All Saints' Sunday falls during the season of Pentecost. Christ the King is the last Sunday of Pentecost and of the church year, when Christians celebrate Christ Triumphant, ruler of everyone and everything.